The above details are now confirmed from Parish records at St Mabon's Church, Llanfabon. I had not been able to find out much about Charles Ruck, but at the bottom of this page in brown is the original entry for this page. This has enabled Amanda Luty (Ruck) to give me some more information about the family. My thanks to her for the information, and I hope she has more info I can put into this page. Charles Ruck’s father’s name was James. Amanda has informed me that the family moved to Llangattock Lingoed where they had thirteen children, three of which were step-brothers and sisters. She informed me that Charles’ brother Tom also served in the First World War and I have asked her for more information about Tom, who was her grandfather. Amanda also said that there was a war memorial in the parish of Llantilio Crossenny where the family must have lived at one time. The memorial is actually what remains of an ancient cross in the churchyard of St Teilo’s Church, Llantilio Crossenny. Charles Ruck is one of ten men from the parish honoured for their sacrifice in The First World War. There are two men named from the Second World War. I have since been able to find out the following information about Charles Ruck. I am not sure when he came to the Nelson area, but recent records I have found show that in 1913 he was living in the Nelson area and was listed as a miner. He had been married in the fourth quarter of 1912. He married a Mary Thomas and the marriage was registered in his birth area of Monmouthshire. Haelfryn James was born in 1915 and baptized in October that year. Sadly, this was five months after his father, Charles, had been killed. I have not been able to find out much information about Charles Ruck himself. I have directed my research towards his birthplace, Grosmont, Monmouthshire. I have located several people with the same family name. An unusual name that I believe them to be related in some way. Maybe the below details are Charles immediate family. Maybe these details could refresh someone’s memory or allow descendants to provide me more accurate information. 1891 census records show that Edwin Ruck (b. 1847) was married to Annie (b. 1863). There are only four children listed on 1891 census. Charles is not present, but it is possible that he may not have been born until after that date. 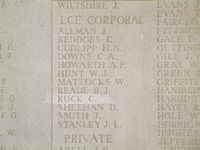 Mrs Ruck, Tai Fforest Houses, has received an official communication from the war office stating her husband Cpl Ruck, South Wales Borderers has been killed in action. 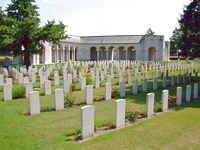 Corporal Charles Ruck, 8282, South Wales Borderers, killed in action at Richebourg S’avoie, France. The deceased who belonged to Regimental Police Headquarters company of the 1st Battalion was an old soldier and had served 12 years with the colours and several years and the reserves. He was sent to the front very early in the war, taking part in most of the fighting. He was killed during battle. I wish this would come to a finish, one way or the other, as I am growing tired of it, and I wish I was home with our dear little boys and you. But, dear wife, it will be one way or the other before the time that this reaches you, as we shall have gone through one of the biggest battles ever known. I hope God will spare me through it, but perhaps you will hear in England before we know ourselves how we have done. We have a bad 48hours in front of us all here. I pray to God this will not be the last. God bless you all. It was during the battle referred to in this letter that Corporal Ruck was killed, the letter having been written on May 9th.